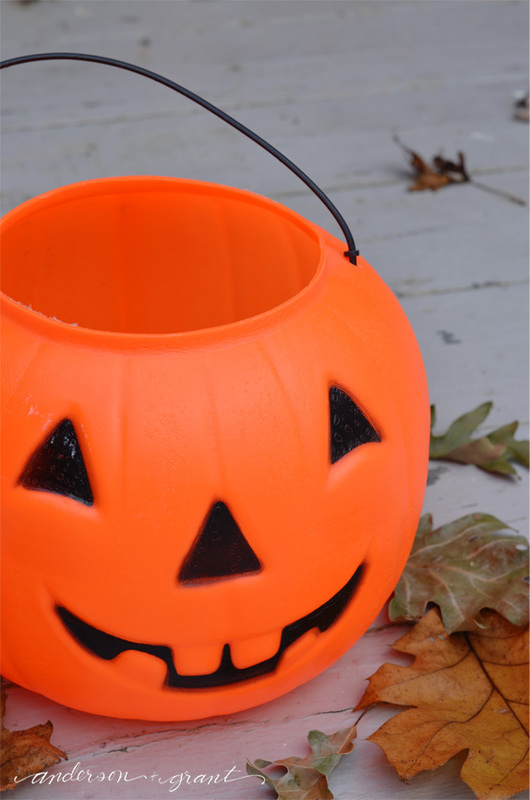 Halloween has become the second most decorated holiday after Christmas. Yet, I've never really embraced the ghosts, cobwebs, and tombstones that adorn many homes. Even so, I do enjoy looking through the creative ideas that all of you have. 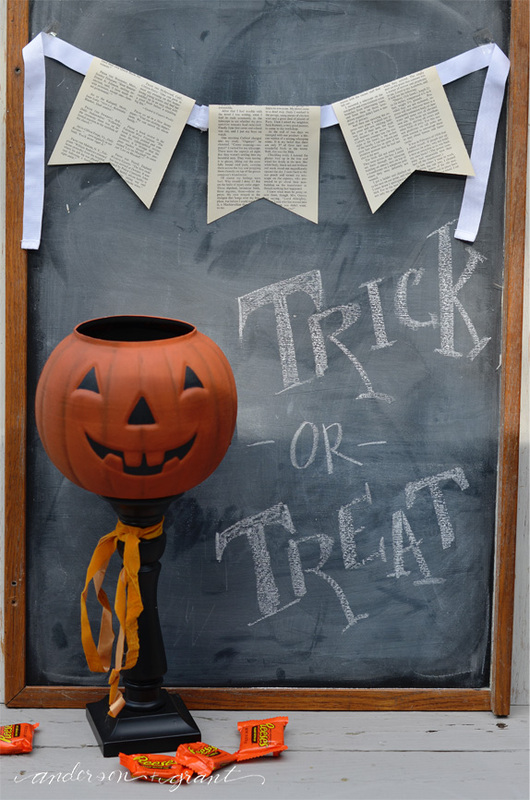 While browsing through the web, I came across a trick or treat banner. It wasn't the banner that caught my attention, though. It was a Jack o' lantern on a stand that I knew we could all DIY. 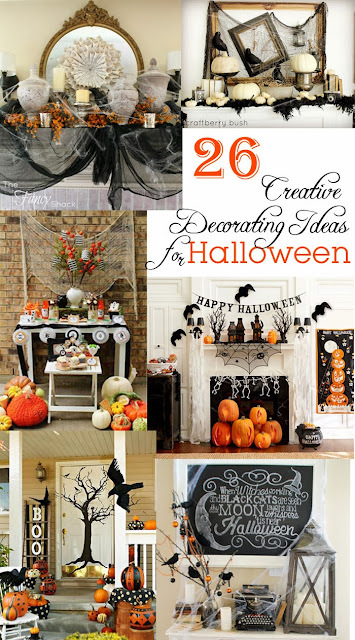 This is seriously the easiest Halloween project that you could probably make! And aside from the time you'll have to give the paint to dry, it can be completed in no time at all. 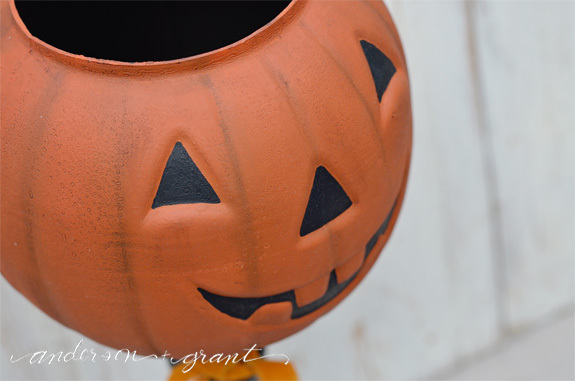 The Jack o' lantern buckets are available in large supply at just about any thrift store (or they can be picked up for a little more at places like Target or your local grocery store) which makes this an inexpensive DIY. 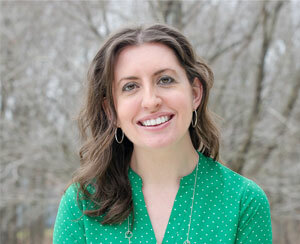 Three important characteristics for any great do it yourself project...easy, fast, and cheap! 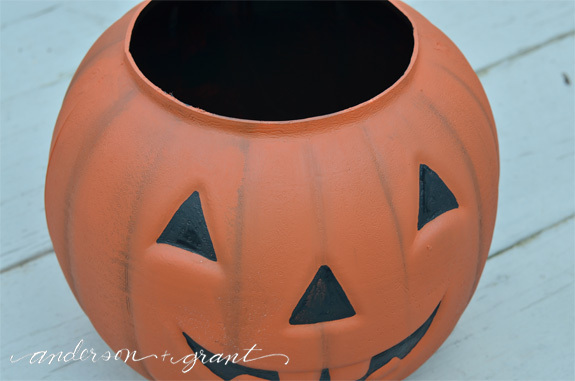 Begin by removing the black handle from your Jack o' lantern bucket. Fill in the two small holes with some nail hole filler . 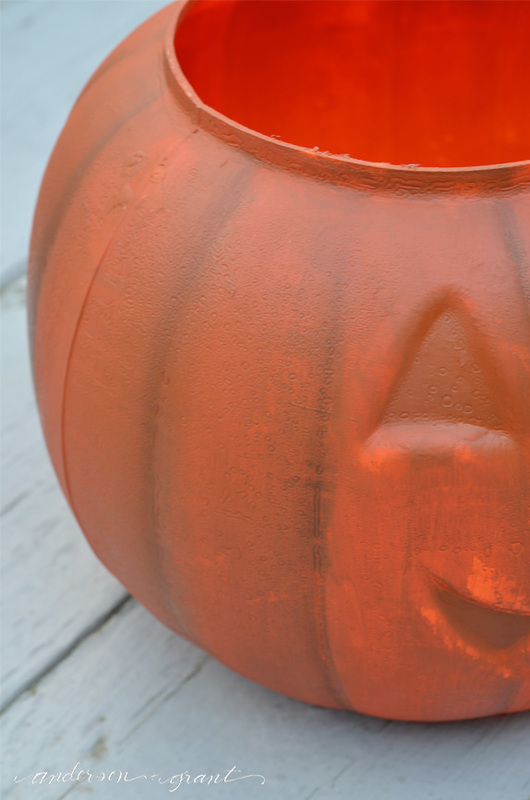 Paint the entire outside of the pumpkin with burnt orange paint. You'll probably need a couple of coats. While the paint is still wet, add a little burnt umber into the inner spaces of the pumpkin and blend it into the orange paint. This will give the Jack o' lantern a little definition when it is done. 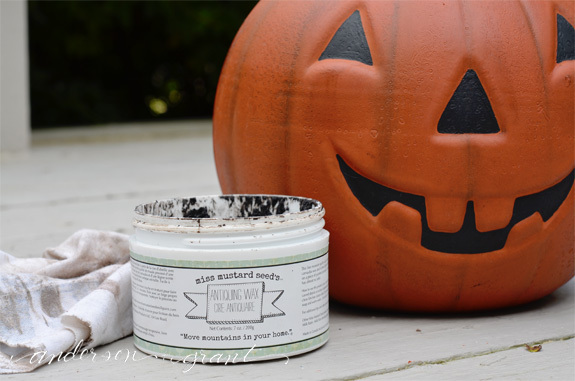 When the paint is dry, paint the face and the inside of your pumpkin black. Coat the outside with either Antiquing wax or antiquing medium . I love wax, but it can be pricey to buy just for a small craft project. Antiquing medium is a gel stain that can be picked up at most craft stores. It comes in a small bottle like craft paint and is much more cost effective for using occasionally. It dries quickly, though, so work in a small area and remove the excess stain with a slightly damp rag. 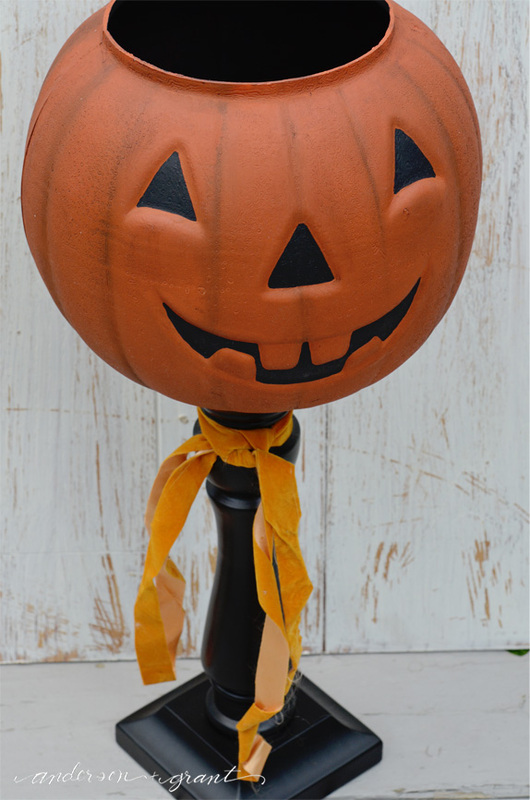 You may already have a large black candle stick in your everyday decorations. If not, they can be found at thrift stores or craft stores. And if you can't find a black one, it can always be painted. 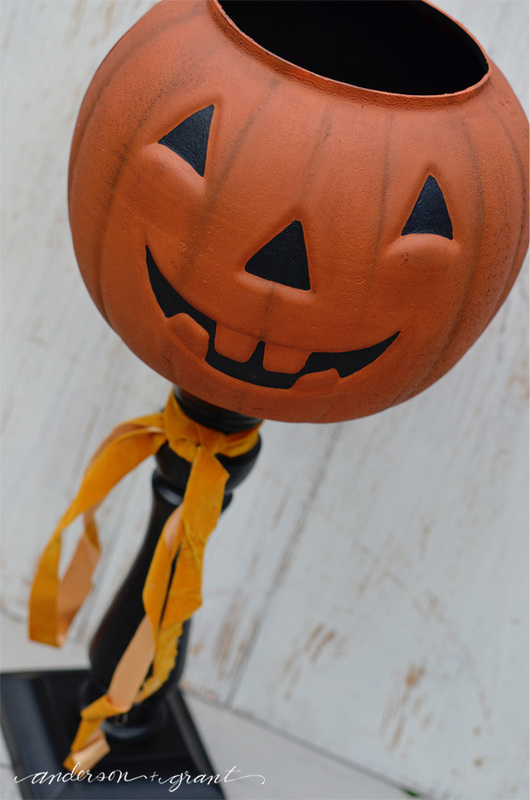 I chose not to attach my pumpkin to the candlestick, but if you want to join them it would be easy to attach a screw inside the pumpkin down into the candlestick. Tie a ribbon around your candlestick and your project is done! 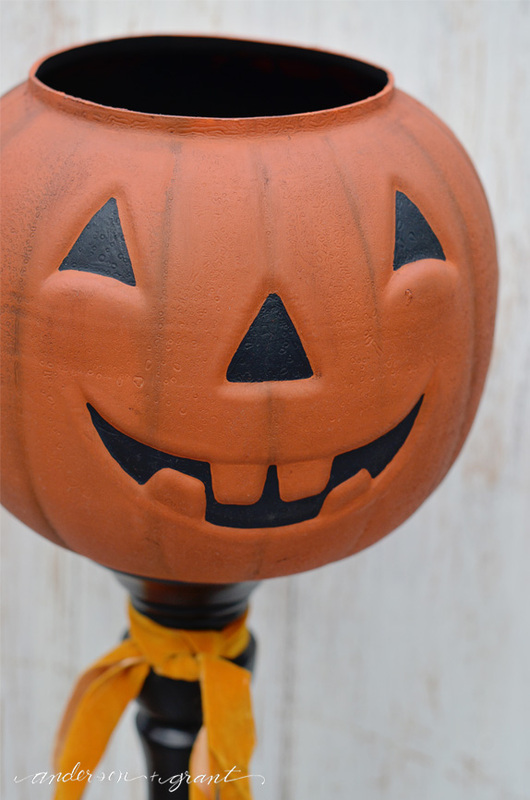 Even though I don't decorate much for the holiday, I'm really excited about using this little guy for holding candy for trick-or-treat-ers on the big day. What do you think my Halloween thrift store transformation?